We all know Rome is one of many great honeymoon destinations but certain areas hold greater appeal. In a city as colossal as Rome, the neighborhoods are many and far between. The Centro Storico opens up to countless little pockets of personality, just waiting for a traveler to get lost in for the afternoon or evening. Trastevere might beat out some of Rome’s other distinctive neighborhoods in terms of interest and intrigue. Literally meaning “across the Tiber”, Trastevere seems to be where all of the action outside of the Trevi Fountain and Coliseum can be found in the Eternal City. Flower boxes bursting with color and ivy clinging effortlessly, complete with antique Italian Fiats in the alleyways are the picture of Trastevere, and often the picture of Italy. Just south of Vatican City, on the west bank of the Tiber, Trastevere leaves room for exploration. This is one part of Rome you will want to know and know well. When you look up how to get to Rome’s Church of Santa Maria, you will come up with several options. Be sure you are heading to the church in Trastevere, built way back in 337 A.D. 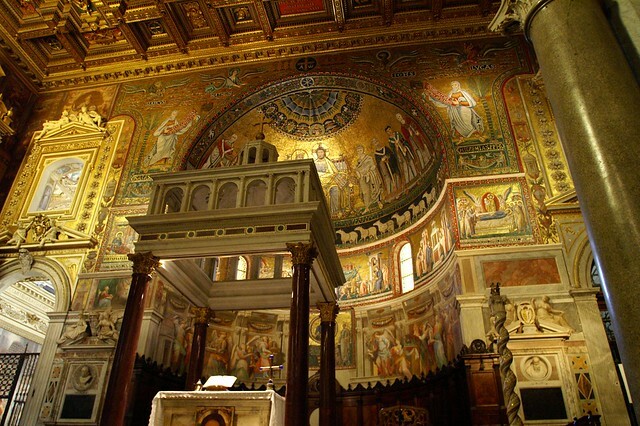 The Basilica di Santa Maria in Trastevere is said to be the oldest church dedicated to the Virgin Mary in all of Rome. In 1138, it was restored with a Romanesque bell tower. The popular gathering place in Trastevere is easily Piazza Santa Maria. The Piazza completes with an octagonal fountain restored by Carlo Fontana, of all names, at the center of the square. Piazza Santa Maria, like the rest of this city, is of Roman origin. The evening passeggiata is a ritual that takes place here, as it has for centuries. Locals and tourists come out to roam the streets before or after dinnertime. On occasion, street performers will park in this historic Piazza to entertain the masses. If people-watching is your sport of choice, Piazza Santa Maria in Trastevere should be your perch while in Rome. Trastevere is home to so many restaurants that it can be difficult to select a good one. Some of the best eateries lie down side streets in this neighborhood. If you are in the market for some of Rome’s best pizza, Dar Poeta can be found perfectly on one of those side streets in Trastevere. The slow-rising dough and cheap prices draw in the crowds of locals and a few travelers in the know. Be sure to arrive here early or you will have to wait it out with the crowds in the tiny street in front of the pizzeria. Most seating is out in the open, complete with red and white checkered tablecloths. In Rome, there is always a sea of activity, especially at night. This city could give New York a run as the other city that never sleeps. Trastevere is a big part of that nocturnal side to Rome. The neighborhood features countless bars and drinking holes. It is the place to be at night, whether you are a mere tourist or an in-the-know local. Those traveling solo will have a hard time feeling alone in the midst of Trastevere’s nightlife. The area is also generally very safe at night for there is so much activity going on. The bars open up into the streets, many with seating looking out on to the action. Park yourself at a table, watch the world go by and make some friends. The magic of Rome’s nightlife appears to be centered in Trastevere.